Aided by her keen elven senses and the tiny sphere of magical light, emanating from the end of her twisted staff, Demin stomped across the lichen-covered floor of the abandoned grotto, frowning at the faint but persistent smell of decay that filled the desecrated ruins. It was not the lingering stench of corpse-rot: when the drow had been driven back into the darkness, they had carried away the bodies of their slain. Most of the elven dead - both the slain warriors and the priests captured in the original raid and subsequently tortured, impaled, or flayed alive - had been gathered and cremated, so that their corpses could not be animated in some vile necromantic ritual. But much to Demin’s sorrow, several elven bodies had never been recovered. She also suspected that some of the elven Spirits - the ones that had died in great pain - had never reached Arvandor, but were instead trapped in the endless maze of the Underdark’s caves and tunnels that lay deep beneath her feet, below the dusty tiles of the cracked mosaic floor. More then once the priestess had considered sending a team of priests after them, but something had always stopped her from pressing the issue with the Queen. This asserted spiritual infestation was the main reason for abandoning the grotto to its fate of a monument to the slain, and constructing, or rather, cultivating, the new temple sanctuary just a few dozen paces to the East. With some encouragement from the Temple’s druids, the forest had already started its cleansing progress into the desecrated nymphaeum - the outer anteroom of the ruined structure - the tree roots had widened the cracks in the tile-covered walls, and were now breaking from the sides and dangling above her head as she made her way deeper under the hill. Pale rock moss covered the floor, and somewhere in the corner Demin could hear the quiet trickling of water, falling into the broken bowl of a wall fountain. The abandoned sanctuary was not particularly spacious, but consisted of many small pockets and partitions, once used for storage and similar mundane functions. Eventually, Demin made her way into the former scroll vault, through which the drow invasion force had entered. When the facility had been in use, the priests had kept the air dry with the help of their magic, and the underground location provided a cold, shady environment, so vital for the safety of old parchments. The drow had plundered most of the collection, and the remaining parchments had been removed to a safer location once the priests had returned. Now the rows upon rows of empty pigeonholes and bare shelves seemed to follow Demin’s progress as she walked by, calling out to her in mute despair and indictment with their emptiness. The priestess determinedly passed the shattered lectern, upon which the body of the chief librarian, her old teacher and friend, had been found, pinned there by a drow javelin. The rotting wood was still stained by his blood. Sighing, she followed the spiraling staircase as it led further down, to the deepest cellar. At first sight, it was even darker and gloomier down here, despite the spark of magic light that she carried on her staff. Then the priestess noted the faintest glow of the magic wards in the furthest corner - that was were the drow invaders had breached the wall, having first dug their way along a thick vein of limestone, creating a wide passage that connected the cellar with the caverns below. Once the drow had been defeated, the rift had been filled with blocks of stone, fenced with a mithril grille, and fortified with several layers of protective magic. Yet it was still possible for a creature of good intent to pass through the layout of magic traps, even though the passage heaved with more alarms than a festive cake had raisins. From the start, Demin had been very much against this arrangement - Adalon had always managed to stay in touch with the surface using remote passages within the crags of the Starspires. 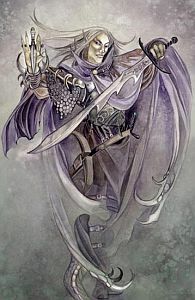 Yet the new Guardian had succeeded in convincing Ellesime that it would be more advantageous for him to have a more direct communication channel with the surface, stressing that it was beneficial to keep public attention on the one entrance into the Underdark, while his minions were watching over the smaller, less well-known passages from the inside. Frowning at the sudden premonition, even as she muttered her prayers checking her protection spells, Demin touched the cold bars of the mithril trellis that separated the ruined basement from the dark caverns beyond. It opened at her slightest touch, as she had fully expected. The Temple patrol must be out there somewhere, she thought briefly, peering into the soft glow ahead. Besides, she was wearing enough protections on her person to hinder the advance of a small army. At last, driven by her pride and purpose, the priestess walked forward boldly crossing the warded passage leading beyond the Temple’s borders, and stopping only a few feet away from the source of mysterious light, with her mouth dropping open in incredulity. She had entered a natural cave - the one in which the drow invaders had once camped in preparation for the attack. Knowing her counterpart, she had expected some kind of a performance, but what she saw went beyond even her worst expectations. For a minute or so, the High Priestess of Rillifane and Queen Ellesime’s best friend looked on at the view before her, shaking her head in disbelief all the while. Someone had invested a lot of time and energy to turn this part of the dark and gloomy cavern into the semblance of an opulent southern bazaar. Tall copper braziers, filled to the brim with aromatic coals, spilled waves of warm golden light on the piles of glittering treasure. Plush carpets accented with intricate geometric design covered the dusty floor, while painted silk screens and curtains masked the walls of rough stone. She even spotted a few potted plants in porcelain vases, and a delicate bronze group depicting a pair of nymphs chased by satyrs. Metal-studded strongboxes and fortified caskets cluttered the space, many with their lids thrown open, shamelessly exposing the riches within. Stacks of glittering moonstones vied for attention with pyramids of uncut garnets, and mounds of sea-green beryls. Fat golden nuggets glittered gloomily in their cases, amidst tarnished lumps of silver and bars of bright mithril. And as if all that explosion of colors was not enough, a small drove of multihued lizards lurked among the stones, adding to the overall impression of untidiness. The treasure was well-looked after - Demin noticed distractedly, all the while marveling at the elaborateness of the display. About half a dozen small figures, swathed up to their eyebrows in grey and brown rugs and armed with tiny hammers and tongs, lurched to and fro between the low tables laden with gemstones and nuggets, rearranging the treasure to their liking, pulling the most pure and prominent gems from under the piles of their less attractive cousins, and feeding the copper braziers with small chunks of coal. Their small sharp eyes, gleaming like obsidian shards, betrayed their race - svirfneblin - the quiet and secretive deep gnomes, never encountered on the surface. And among that buzz, like a termite queen enthroned at the very center of her busy nest, sat a small rounded figure, clad in bright silken garments. The color scheme of that splendid, if slightly tacky, outfit most closely resembled that of a peacock tail, but tended to deviate into peach and salmon tones, with only a few splashes of dark metallic blue and rich malachite-green. The figure’s resemblance to a bizarre insect was only accentuated by a pair of multifaceted spectacles cut from what looked like highest-quality emeralds, which were perched on the creature's prominent nose. The goggles' bent and twisted golden wires were hooked around the wearer’s pointy ears, sticking from under the shock of thick, copper-red hair, gathered at the back into a frazzled pony-tail. The overall impression was that of sloppiness mixed with flamboyance, a combination that Demin with her orderly nature found quite unsettling. It was hard to distinguish the sitter’s gender, let alone race or calling, but Demin was too old and too experienced to be fooled by such nonsensical tricks. The small copper ring which the priestess wore on the small finger of her left hand began to tingle as soon as she entered the basement, giving her one more unpleasant sensation to worry about. It was shaped in a form of a snarling wyvern, and the fact that her prisoner had described the ring’s properties in great detail did not add much to her comfort. Quite to the contrary Demin began to wonder if donning it before going to her meeting with the Guardian had been such a great idea after all. The brightly-clad gnome grinned, showing two rows of sharp, white teeth and the quick flash of a tongue, dark and pointed at the end, then jumped from his perch on the ornately gilded armchair behind the desk, and practically rolled towards her on his short legs, all the while smiling and nodding with great enthusiasm. "Welcome to my humble establishment, eminent Sister. I daresay you look somewhat tense. I hope you are content, but if not - maybe I can cheer you up a little? Perhaps you'd fancy a pair of new diamond-incrusted buckles for your shoes, or a pair of earrings to match your eyes? No? What a pity. I've got an absolutely spectacular pair of tiger-eyes, they'll go nicely with your outfit!" “Oh, by Rillifane’s great trunk, let’s drop this pointless flattery!” The priestess frowned at the orator, whose face now bore an expression of mock horror - supposedly caused by her chilly attitude. “Did you, by chance, call upon me only for this untidy display?" Demin nodded at the sparkling gemstones and lumps of precious metals around them. "I am quite busy at the moment." “Woe unto me, for I have angered the most beautiful and majestic of the Mistresses of the House of Leaflord!" The self-proclaimed gem-trader wailed in distress. Yet his wide mouth quirked in a half-suppressed grin, and somehow Demin was certain that under the semi-translucent spheres of his green goggles, his eyes were full of laughter. "You are exaggerating again, Greenberyl,” Demin replied sourly, after taking control of her annoyance. "I am not angry with you, but I will be, if you keep up to your silly act. I told you I am very busy - either give up your games and go straight to the point, or I am going back to my chambers." “Well!” the creature huffed in reply. “Be like that then. Don't mind poor old me. I just thought you might like the glamour... But no. You've got no time for me, stuck here in this stuffy little cave, while your kind goes on with their spectacular lives out there in the big, wide world, never sparing a thought for the poor old stonecutter down here...” He continued in an increasingly melancholy tone, only betrayed by a twitching in the corner of his mouth. "You seem to have plenty of company," Demin objected, nodding at the small figures of svirfneblin tiptoeing between the chests and boxes, and bit her tongue at her repeated inability not to stray away from her purpose. But Greenberyl was an accomplished provocateur, she admitted to herself. "Would you be as strict as to deny me even the company of these humble exiles, eminent Sister?" the wily midget pleaded, waving his short, sturdy paws in a clownish show of anxiety. "I honor my contract with Her Majesty, watching day and night over her lurking Enemy. But certainly, even the most steadfast of Guardians should have his moments of respite, ere boredom blunts the edge of his vigilance! Since you rarely honor me with your distinguished presence, I have to be content with what company I can solicit. Not to diminish the qualities of this solid folk, mind you." Demin moaned, realizing the mistake of giving her counterpart an opening. Alas, it was already too late. If she knew anything about his kind, Berylgreen could indulge himself with chit-chat for hours. “Remarkable.” Demin clucked her tongue, finally giving up on the attempts to outtalk her interlocutor. “But seriously, honey-tongued-One, as much as I appreciate your company, I must excuse myself. I have duties to attend to at the Temple.” She made a move as if to turn away from the creature and his elaborate display, noting from the corner of her eye the undulating quality of light emanating from the braziers. There was definitely something unnatural about the shadows obscuring the furthest reaches of the cavern. “Most glorious lady! You are forcing me to abandon the play at the very first act!” Greenberyl yelped at her. “Is there no love left for a good game in the hearts of fun-loving People? Aye, aye - I give up!” The gnome abandoned his over-cheerful attitude, shifting into a more business-like tone. Once again he waved his small paws, and the whole show - the braziers and the tables with their treasure, the caskets, even his magnificent chair vanished from sight, revealing the rather less splendid view of a bare stone floor covered with dust. All of the attendant svirfneblin were gone as well, except for one small figure, swathed to the tip of its nose in a hooded brown robe. The creature remained silent, hovering behind Greenberyl’s back, and tending to the single remaining brazier. The shadows that cloaked the rest of the cavern faded away, and now Demin could see a number of tunnel mouths on the far side, some of them punctuated by blazing torches held in wall scones. She assumed these were maintained by the elven patrol. The copper ring on Demin’s finger gave another strong tingle. Of course this was not unexpected, considering her present company. At the last syllables of his remarkable speech Greenberyl’s voice changed in volume as drastically as his appearance, booming in Demin’s ears like the tolling of a huge bell. Having dwelled in the same city with Adalon for near a century, the high priestess of Rillifane was somewhat familiar with dragons and their ways, yet Greenberyl’s transformation was impressive all the same. Even as the bright silks of gnome’s clothes transformed into salmon-and-peach-colored scales, the creature’s bulk swelled, suddenly taking much of the cavern’s space. In a matter of few seconds the dragon’s body, cased in a reddish metallic shell – sheer bronze in its hue – towered over Demin, making her feel quite small. The huge yet elegant head, crowned with a pair of slim horns and decorated with a fringe of scaly mustache, dipped down to the level of her face, grinning at her with a familiar sly expression although the teeth – the size of a small sword – made the general appearance of that smile somewhat less humorous. Distractedly, Demin also noted that the emerald goggles were still perched on the trickster’s nose, only now they were the size of a small wheelbarrow. Shaken and exhausted by my latest ‘interview’ with sister Demin, I collapsed the moment when her guards had brought me to my fancy prison cell. Next I craved oblivion. Great were both my anger and my disappointment with myself, for I had given in too much and learned a trifle. Shameful were my tears. At some point I would have welcomed even the nightmare-ridden sleep of Amkethran, yet rest eluded me. Sweating from disgrace, I lay awake on top of narrow bed, while staring blindly at the play of light on tiles of marble floor. My initial optimism inspired by the fact that I was locked in a spacious and inviting service room instead of a foul dungeon, was long gone – a prison was a prison. Frankly, I resented the elves’ sanctimonious ‘kindness’ more than I would have loathed being kept in a damp and sunless hole below the ground. Passing through the stained glass above, the moon rays gained the greenish tint, which made the room look like a deck of sunken ship. A nasty simile that left me with the role of drowned galley-slave. One of the many nameless skeletons, both mute and worthless, forever bound to their seats with rust-encrusted chains, their bones picked clean by hungry fish and crabs. A partaker in the fellowship of chained husks, crouched under rotten benches and riddled with rusted bolts – still stuck in their hollow ribcages, yet others intertwined with carcasses of their former masters. I made an effort to chuckle at the reflection, then subdued, acquiescent to my muteness, fuming over it. Indeed, when I had tried, (quite unsuccessfully), to laugh, the chains that bound my wrists and ankles had produced a silver chime. My lips remained silent. Little did I know of where the vision of the boat and of her drowned crew had come from, nor did I possess a slightest clue as to their origin. Likely it was just another dream born of my violated and distorted mind. Yet the image was as lucid and complete as that of closed door which led to freedom. The door, which was locked and dead-bolted from the other side; a relatively pointless provision, since in my stunted state I had little chance to manage an escape. So deep was my self absorption, so focused was I on the contemplation of my miseries, so ridden with self-loathing, that I had failed to see his entry, only noticing that something was amiss when Ryndeth’s shadow felt over my face, blocking the flow of moonlight and interrupting my anguished thoughts. Instantly I jerked upright, instinctively bringing my chained hands between the reach of his fists and my face. Not that in my state I could protect myself against an armed opponent, and I had already noticed a glimmer of a blade at his hip. No one would hear the noise of our struggle, and no one would come to investigate. The elven captain had me at his full disposal – I realized that the moment his face registered in my mind. Trying not to show any outward interest and using the advantage of the semi-darkness, I scanned him briefly. The elf was dressed in a set of dark leathers, behind his back I spotted a slim shadow of a longbow. A quiver full of arrows hung at his left side, whilst on the right his sword-hand caressed the hilt of a slightly curved blade. And these were only the weapons that he did not bother to hide, as I was certain he had a number of others concealed upon his person. Ryndeth’s face bore an expression of amusement, which was not something I had expected. As a matter of fact, the elf looked rather pleased with himself, grinning like a small kid about to play a prank on his comrade. This was the first time ever that I observed him when he was not full of anger and contempt. Remarkably, his sharp feral face, tattooed with the tribal markings of his clan, looked rather boyish when he was smiling. Unexpectedly, his smile touched a string, and something hummed inside me in response, almost as if I was ready to remember a connection long forgotten. I was certain that Ryndeth could not have possibly caught that sudden mood swing, yet his expression darkened almost instantly. Once again I was a prisoner facing a stern and unpredictable opponent. Very slowly and deliberately, I lowered my hands down, making sure that he understood that I refused to cave in to his bullying. Ryndeth caught my stare, then his gaze flickered, and he quickly broke the eye contact, looking away from me. Just then I noticed that his hands were playing with a knotted leather strap, attached to a small object, likely a pouch or an amulet. Regardless of its nature, the string looked as if it could be easily used as a garrote. “Demin was right,” Ryndeth continued after the briefest of pauses, “for Irenicus would not have tolerated this imprisonment for long, no matter how strong the sister’s faith is, and how good is she at her prayers. You are nothing but a skillfully made flesh golem, Broken One, an imitation of life animated by Irenicus’s vile magic.” Here he grinned again, looking at his hands, a secret little smile of someone about to get their dearest wish. That was when I started to suspect that my visitor was not entirely sane. The syllables of his fast, feverish speech were somewhat slurred, and his eyes possessed that special bright luster common in saints and maniacs. I was not sure if the Children were susceptive to the temporary fits of insanity, or if Ryndeth was under an influence of some unknown narcotic, but both of the possibilities were equally bad. That worry kept me from paying too much attention to the essence of his taunts, at least at the moment. Being denied a way to make a verbal reply I raised an eyebrow – a simple enough jest – but it stopped Ryndeth gibbering as certainly as a slap on the face. His reaction was odd, but I was glad I earned a few moments of respite from his assault. Admittedly, there were many reasons to dismiss Ryndeth's prattle as nonsensical. Firstly, I did not possess enough information on the subject of cloning. My studies in the Queen Zaranda’s Royal library had been cut short by my abduction, and the topic had never come up in any of the arcane texts that I had managed to peruse since leaving Amkethran. Besides, I had been focused on the story offered by Aluril, and later confirmed by the dying dragon. Finally, I was too concerned about Ryndeth’s obvious hostility to bother making sense of his claims. Still, the elven captain’s newly found certainty made me curious. It took me months to adjust to the idea of being an incarnation of some Seldarine-cursed evil genius, and now I was offered a different solution to the riddle of my existence, one that did nothing to spare my ego. There were certain facts that did not fit into Ryndeth’s explanation. For one, I was not a mindless automaton that he imagined me to be, but the simplicity of the idea was seductive. The sound of that name had nearly made me sick again, but I managed to suppress the worst of the reaction. Ryndeth’s tale was too intriguing to allow for distractions. The arrogant fool had provided me with the whole lot of information, though I was not sure if at this point it could boost my prospects of surviving the night. I had to keep him occupied with conversation, I decided suddenly, as my only chance was to drag time until someone would come to check on me. I understood that Ryndeth was ready to end my existence in one way or another – likely that was the whole purpose of his visit. I guessed, (incorrectly as it turned out), that the only thing he was undecided about was the method he would employ. That also gave me a small opening. One relying too much on improvisation sometimes loses focus. The elf snorted, rolling back and forth on the balls of his feet, visibly restless in my presence. “What is in it for you, Broken One?” He inquired passionately. “Do you posses the smallest spark of individuality? Do you want to break free from the will of your ‘master’ or would you blindly follow the path of bread crumbs that he had laid for you, dooming us all in process?” He tilted his head studying my expression. This time I did not avoid his gaze, purposefully withstanding the dark blaze of his stare. Eventually, he lowered his eyes. That was when I slowly shook my head, stressing my disagreement with his last words. Very slowly, I nodded, than pointed at my mouth with both of my chained hands, finally shaking my head in dissent.